Oren Lyons is a traditional faithkeeper of the Turtle Clan of the Onondaga Nation who sits on the Onondaga Council of Chiefs. Born in 1930, he was raised in the traditional life ways of the Haudenosaunee on the Seneca and Onondaga reservations. 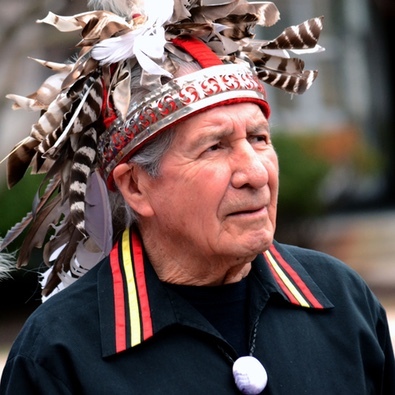 As a youth he left for New York City but in 1970, Lyons returned to his ancestral homeland in upstate New York to act as Faithkeeper of the Turtle Clan. In this capacity, he is entrusted with keeping alive his people’s traditions, values and history. Since then he has dedicated his life to preserving and protecting indigenous lifeways by being one of the key players in establishing the Working Group on Indigenous Peoples at the United Nations. He is deeply involved with national and international issues that affect native peoples and has represented them in many forums throughout the world, focusing on the rights and status of indigenous peoples, the environment and sustainable development. In 1977 he help create the Traditional Circle of Indian Elders and Youth. Since then with the financial and administrative support of the American Indian Institute, the Traditional Circle has gathered each year at a different site in Indian country. He has traveled the world and given many lectures where he has spoken about the importance of the indigenous perspective and way of life, creating awareness on his People’s ways. Among his accolades he has received the Ellis Island Congressional Medal of Honor, the National Audubon Award, the First Annual Earth Day International Award of the United Nations, the Elder and Wiser Award of the Rosa Parks Institute for Human Rights, as well as the Wisdom Fellowship Award of the Sacred Fire Foundation. He serves on the Executive Committee of the Global Forum of Spiritual and Parliamentary Leaders on Human Survival, and is a principal figure in the Traditional Circle of Indian Elders.